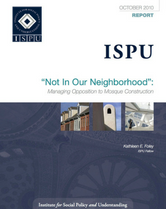 This report is intended as a best practices guide for U.S. municipal authorities—elected officials, municipal attorneys, planners and appointed review board members—as they steward and adjudicate development applications for mosques and related accessory uses and attempt to manage and reduce conflict around those proposals. Recommendations are drawn from case studies of mosque proposals made in the eighteen months following September 11, 2001, arguably the most tumultuous period for such developments until the storm of contention stirred by the so-called Ground Zero mosque, also known as the Park 51 development. The recommendations are grounded in the requirements of the key federal legislation for the review of religious land use proposals, the Religious Land Use and Institutionalized Persons Act of 2000 (RLUIPA). This broad foundation makes the report informative for any type of religious land use proposal despite its specific focus on mosque developments.